BERLIN -- As an American, I take my freedoms for granted. 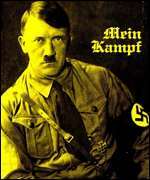 But today, when I went to order Adolf Hitler's Mein Kampf from Amazon.com, I was informed -- disingenuously, in fact -- that my order could not be processed. "We're sorry," Amazon.com said. "At this time we are not able to ship this item to an address outside the United States." Barnesandnoble.com, however, promptly processed my order, and I plan to spend a few unpleasant days near the end of the 1900s stewing in the ramblings of the man who unleashed such horror on Europe and the world. Living in Berlin, where Hitler's famous bunker was recently unearthed by a construction crew, I do not have the option of ignoring history. The German-language edition of Hitler's political manifesto is banned in Germany, a sign of just how tender a matter the legacy of World War II remains. But the recent Amazon ban on shipping Mein Kampf to Germany -- not to all of Europe, as claimed -- involves English-language editions. The German Justice Ministry contends that it doesn't matter in what language the book is published; German law still restricts its sale, though the term "ban" is somewhat problematical. "If you go to a bookshop, the bookseller can have a look at you and decide if you are really interested, like if you are a student," explained Arns Christian, a Justice Ministry spokesman. "It's not the book that's forbidden, it's selling it to everyone. "If you sell it through the Internet, you don't know who wants to buy the book, you give it to everybody, and that's forbidden. We can't do anything against the booksellers in the United States, because German law is only in Germany, but what we can do is talk to everybody that has to do with the matter." Minister of Justice Herta Däubler-Gmelin sent letters urging both Amazon.com and Barnesandnoble.com to refrain from shipping the book to Germany. Amazon.com banned such sales, and Barnesandnoble.com asked for a complete list of restricted books. "Until they get this list, they said they can't do anything, and that's of course wrong," said Christian. "In Germany it's not allowed to sell hate literature, literature of the Nazis. They have to decide on their own. They don't need a list. Of course there is no such list. Newer books are I think more dangerous than Mein Kampf by Hitler. We don't want to have this literature in everybody's hands. So it has to be forbidden."